At Your Service provides some automatic means for database backup, and you can choose typical backup strategies to improve the security of your data. 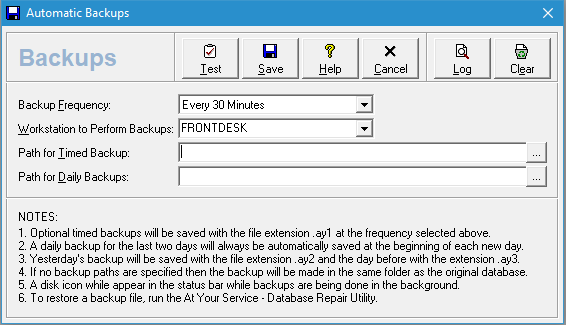 The first option in the backup menu lets you choose to continuously back up your database throughout the day. You can configure your frequency from 5 minutes to 8 hours. The default, recommended frequency is 30 minutes. If you raise this value too high, less of your data will be backed up, and if you lower it too far you will place unnecessary stress on your network and system resources. Select the workstation to run the backup task. Choose a workstation that will most often be powered on and running AYS throughout the day so that the backup will actually take place. At the time chosen, the selected workstation will copy your currently running database to a backup file and named with an “.ay1” extension. If there is an existing timed backup file, it will be replaced so that there is only one copy. If you leave the path boxes empty (as above) the backups will be placed in the same location as the database file. At the start of each day, the .ay1 file will be renamed to .ay2, and any .ay2 file will be renamed .ay3. This provides you with an end-of-day backup for two previous work days. You can identify the files in the file system by the extension, the icon (a red outline with a left-facing arrow) and the description. If you have not configured automatic backup, or the workstation is unavailable, you will see this icon in the AYS status bar. Your database is not being periodically backed up. Note: The automatic backup mechanism is designed as a low-impact, lightweight data backup, but it should not be your only database backup solution. In addition to the automatic backup described above, you should add your database files to your typical backup routine. Since AYS databases are self-contained, this can be as simple as copying the .ays files (and optionally the .ay1, .ay2, and .ay3 files) to another medium, like a network server, a USB drive, and/or an online storage location. You can make an on-demand backup at any time by using File – Backup Database – Save Database Backup or File – Backup Database – Save Zipped Database Backup. You will be prompted for a location to save the resulting file. If you are using a SQL server, the option for automatic timed backup is unnecessary and is disabled. You may still export data on-demand as .ays files (zipped or not) as described under “Regular Full Backups” above. Your regular SQL server backup strategy can be used to back up the databases directly and is described here. How do I send a Microsoft SQL server database to AYS?